Rangers at a natural park in Vietnam rescued a turtle washing up ashore in fishing nets last week, according to the park management. 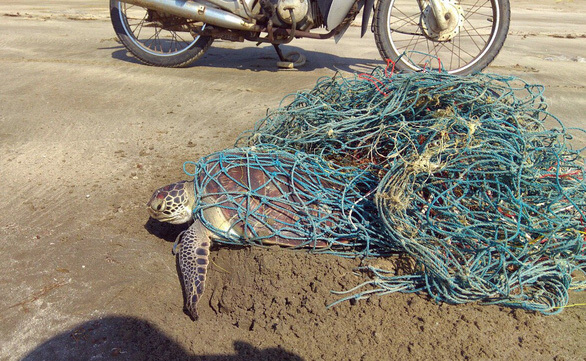 Forest protectors at Con Dao Natural Park, located in Con Dao Islands off the southern province of Ba Ria-Vung Tau, found a turtle weighing around 10kg struggling in used fishing nets when they were on patrol on April 12 morning, the facility’s leader said on Saturday. The fishing nets were thick, heavy, and weighed as much as the turtle, he added. The reptile was healthy when being discovered so it could quickly swim to the sea after the rangers freed it. The management of Con Dao Natural Park said that another turtle was stuck in a bunch of ropes after it crawled to the shore to lay eggs in 2018. They explained that these incidents are indicators of how dangerous waste in the ocean proves to marine life. Most of such waste includes damaged fishing nets and ropes. Many endangered species live in Con Dao Islands. Con Dao is the name of an archipelago situated around 180km off Vung Tau City and 230km away from Ho Chi Minh City. In 1993, Vietnam’s prime minister signed a decision to establish Con Dao National Park, according to the park’s website. Con Dao National Park covers 19,998ha, including 16 islands and islets, 5,998ha of forest and forestland, and a protected area of 14,000ha. Early this year, the park was recognized by the International Union for Conservation of Nature as an important zone to conserve marine animals.